10 Years since the GFC. What’s been done to bring justice? Article Written By: Dr Peter Brandson, CEO & Founder of Bank Reform Now (BRN). Aussies – and the rest of the world – are not getting a fair go while politicians allow the elite and their bankers to rule. The Great Depression was a warning that was not adequately heeded. The 2008 Great Recession (aka Global Financial Crisis) was a reminder of just how at risk we all are from financial skullduggery. What has been done since 2008 to rectify the situation? In a nutshell, central bank controlled interest rates have been slashed to near zero and trillions of dollars of newly "created" "money" was pumped into the world’s economies to artificially maintain asset prices and corporate profits. Despite plans for the "new" money to be pumped in, the bankers thought it would also be a good idea for taxpayers to bail them out. Helpful, meaningful reforms could have seen the people bailed out by the banks rather than the banks steal the peoples' wealth. All the major banks copped multi-billion dollar fines ... but how did that help people that lost their jobs and homes? Was a proper compensation scheme put in place? In Australia in the last ten years we have seen scandal after scandal, multiple fines ... and yet the people affected see no justice. Trust in the system has been destroyed. We are watching a charade. Bank is naughty. Regulator pretends to be upset. Bank pays a tax-deductible fine which is a fraction of the profits. The government gets the money ..... and politicians get donations. Same story right around the world. The banks treat the fines as a cost of doing business. The biggest of the criminals remain in business ... still getting bonuses & influencing politicians - rather than being put in jail & stripped of their ill-gotten assets. On top of this, nations around the world have been convinced to put in place Bail-in laws so that people will lose their bank deposits and superannuation .... next time around ... in order to save the "too big to fail" banks. Just 7 out of 76 Australian Senators were in the chamber and passed the law on the 14th of February this year. It was 10 years ago today and the banks began to fray. In the USA on this day 10 years ago Lehman brothers declared bankrupt and the GFC officially exploded. Lehman was sacrificed - perhaps to make it look like there are consequences for dodgy dealings. Events of the last 10 years suggest the consequences for dodgy dealings remain minimal. How did this financial disaster come about? The driving force was and remains - pathological greed mixed with stupidity - a very toxic combination. Bankers expected that the government would bail them out - with taxpayers' money. Therefore they thought they could get away with almost anything. This is moral hazard. Same applies to individuals. If a banker can forge documents and profit from a criminal act - guess what? He or she will have less incentive to obey the law. Lax regulation meant the banks could create all manner of dodgy financial products and instruments. This includes the derivatives market which is a massive Ponzi scheme now pumped to hundreds of trillion of dollars worldwide. Regulators have been captured by bankers with revolving door staffing. Who else keeps this corrupt system fleecing the people of the world with phony figures and dodgy accounting? The ratings agencies - Standard & Poor's (S&P), Moody's, and Fitch Group .... and the big four accounting and auditing firms: PricewaterhouseCoopers, Deloitte Touche Tohmatsu, Ernst & Young, and KPMG. All still operating as though they had nothing to do with the financial disaster. In the USA - Bill Clinton's government encouraged inappropriate lending. In 1999 he axed the Glass Steagall act which separated speculative investment banking from normal deposit-taking institutions. This allowed the dodgy gambling finance sector to access the funds from the normal trading banks that families and businesses relied on. Both Bill and Hillary Clinton had been paid millions of dollars to speak at bank barbecues ........ this ain't money for nothing ... and your dips for free. In Australia ex-ASIC head Greg Medcraft's background was in derivatives and investment banking with 27 years with French banking giant Societe Generale. He rose to be SocGen's global head of securitisation. He was involved in putting together the first securitisation of non-mortgage assets outside the US in the late 1980s and the first securitisation of a credit card portfolio outside the US in the early 1990s. The current head of ASIC - James Shipton - spent almost a decade at Goldman Sachs in Hong Kong. One major role had him as Managing Director in the securities division. The regulators are products of the system that enriches them. Where do you think their loyalties lie? Our ex-PM Malcolm Turnbull - ex-Goldman Sachs. The head of the European Central Bank Mario Draghi - ex-Goldman Sachs. Head of the Bank of England Mark Carney - ex-Goldman Sachs. USA Secretary of the Treasury Steven Mnuchin - ex-Goldman Sachs. Do you see a pattern here? The combination of these events let the greed and stupidity run unchecked until people began losing their homes, jobs and lives. Greed and stupidity leads to death and destruction every time. While the movers and shakers - or well-connected parasite class - steal our time & money, the middle classes are going backwards with increased cost of living pressures and stagnant wage growth. At the same time, the 0.1% are taking a bigger and growing share of the world’s wealth. This cannot be allowed to stand. Our children will struggle to afford their own home because bankers and their cronies in business and politics wanted to make some extra money. When trust is gone, who will take a risk to build or invest in a business? When you have a go you are treated as a mug or sucker to be ripped off. If the system is not reformed many of us will live smaller lives thinking "why bother? - I won't get a fair go - everything I work for will be stolen one way or another." Once that attitude takes hold watch human progress and wealth plummet. Right now the exploiters running the "system" need us .... we don't need them. We are the producers and the workers. We can all eat, live and be merry on the fruits of our efforts. Do you think you would really miss out on much in a world free of kings, queens, politicians, bankers and lawyers? Humans are smart. We can co-operate - when we get a fair go. There are alternatives to the exploitative system we currently endure. It seems the elite just want all of us in debt - working our whole lives to keep our heads above water – never actually permitted to really own anything bar the trinkets and other distractions they sell us. We are not born free. More like we are born to rent our existence on this Earth. Is this what the "international rules-based order" is all about? Are we going to tolerate being fleeced from birth certificate to death certificate? Have we actually forgotten what living in civilised freedom really means? Australia did not sail through 2008 thanks to a brilliant PM and Treasurer. Our healthy budget and Chinese demand for our resources were the main saving graces. Two of our banks were close to collapse. The US Federal Reserve pumped billions into NAB and Westpac. This was barely reported at the time. I remember because NAB attacked my family in 2008 to try and claw their dodgy operation into solvency. Same way CBA attacked Bankwest clients (it has only just this week been revealed that CBA's purchase of Bankwest was fast-tracked because the bank was about to crash. Bankwest victims have been right all along). The extra spending by Rudd and Swan has left us with a massive government debt on top of one of the highest levels of household debt in the world. Plus by putting in place bank guarantees they have institutionalised moral hazard once more. What should have been done? The Ponzi scheme should have been exposed for what it clearly is. The upper echelon bankers jailed and structural reforms put in place to make the finance system serve the country and the people ..... not the elite. We are still waiting for justice ……. and we will have it. My family endured five years of turmoil before I kicked into action in 2013 to start a people-powered movement to bring about reform. I told NAB that Bank Reform Now will help do the job with the support of many concerned citizens joining together to demand change. In a matter of weeks, Scott Morrison will agree to an extended banking Royal Commission because public pressure has made it impossible for him to refuse. He just doesn’t have the numbers. As I have told bank CEOs – the environment has now changed and they better get with the program. Perhaps they need to see how much money ex-CBA CEO Ian Narev has lost. Rough estimate $50 Million - plus he is now unemployable. The same fate awaits any banker …… and politician that does not recognise what is happening. In reality, we haven’t actually had the 2008 GFC in Australia yet ….. it’s still coming. 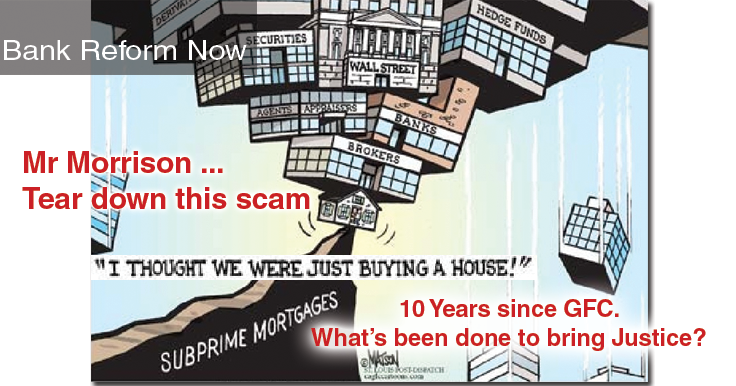 In the USA it was subprime lending – giving money to people that couldn’t afford the loans - that led to the crisis. This is also referred to as a form of control fraud. Bank CEOs love it because every dodgy loan that is written boosts their pay and bonuses. In Australia, this type of lending was known as Low Doc. Right now - a twist in the tale is the time bomb that is set to blow when Interest Only loans switch to Principal and Interest over the next few years. Our banks have also set up thousands of people with unaffordable loans. The tools of the trade - phony loan applications, rigged serviceability calculations, forgery, asset stripping, toothless regulators, paid off pollies. Whoa .... this sounds like criminal activity .... in our banks. Actually, it is organised crime on a grand scale. On the 14th of August, I had a meeting with then-Treasurer Scott Morrison. He told me no other treasurer has ever done as much as he has to reform the banking system. I suggested it was only public pressure that prompted him to make some moves in the right direction. He didn’t agree. Reforms here and internationally are just tinkering around the edges. They assume the current financial system is legitimate and must be protected. Wrong!! We also discussed the housing affordability crisis. I suggested to him that once people are facing a big boost in their mortgage payments we will see people losing their homes followed by a collapse in prices. He just laughed and said no way that was going to happen. Then he rattled off that modelling done by the various agencies and departments all showed that it would be a very slow and slight reduction in home prices. I simply said that those were the same agencies that didn’t pick up on the GFC ten years ago. I’m looking forward to chatting with him again - particularly as he promised to help CBA victim Tanya Hargraves with her dispute with CBA. I also gave him a summary of critical legacy cases that need to attain justice very soon. He seems like a decent fellow. Hopefully, he will rise to the occasion as Prime Minister. Of course, if he doesn’t arrange bipartisan support for an extended Royal Commission and proper legal assistance to bank victims he will be in the job for less than nine months. Let me emphasise this - If both the ALP led by Bill Shorten and the LNP led by Scott Morrison cannot agree to support these two proposals .... it's game over for the major parties. It means they have no intention of doing anything at all in your interests. These proposals are no-brainers. There is no rational argument against them. It’s not the banks that are too big to fail. It is the people that are too big and powerful to fail. When we tell the politicians to "tear down this scam" we mean it. We must have something new ….. something better. In Australia, we will "vote with our votes" at the next election. We can save our feet for walking out on (or kicking out) the politicians that refuse to support our desire for a financial and political system that serves the people. Structural reforms can bring genuine change. These would enable you to have the same, or better, standard of living with half the amount of paid employment. You could be working part-time, job sharing, maybe only working half the year. And - you would have world class services - education, health, transport, proper retirements. It's all possible .... but a pollie will never ever show you the way. The Australian Election 2019 campaign has begun, and we will be discussing the unmentionable issue. We will be offering a mix of policy solutions not seen before. It must start with bank reform, but it continues with political reform. Join in - see below for how you can help. Check out and support the CEC drafted Banking System Reform (Separation of Banks) Bill 2018. MP Bob Katter introduced this into Parliament on 25th June to enact a Glass-Steagall separation of Australia’s banks. Ten Years On From The GFC - Are We Heading For Another? how Australia was affected and warns that in 2018 we could be headed for another. "I believe that banking institutions are more dangerous to our liberties than standing armies. If the American people ever allow private banks to control the issue of their currency, first by inflation, then by deflation, the banks and corporations that will grow up around the banks will deprive the people of all property - until their children wake-up homeless on the continent their fathers conquered. The issuing power should be taken from the banks and restored to the people, to whom it properly belongs."